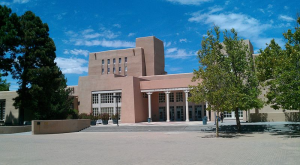 The main library on the University of New Mexico campus, located in Albuquerque. The library was built in 1938 and in 1961 was named after the late university president James F. Zimmerman. Designed in the iconic Spanish-Pueblo Revival style by John Gaw Meem, the building's design was inspired by colonial Spanish missions and pueblo adobe architecture. Local Native American and Hispanic artists were commissioned to design and execute interior wood carvings and tin works. The structure's focal point is a distinctive nine-story tower that can be seen from various points in the surrounding area. The tower, which was intended to hold 70% of the library's book collection, proved to be insufficient as the collection expanded, and new additions to the library were built in 1965, in 1974, and in 2001. In addition to its book collections and student study area, the Zimmerman Library offers a variety of research and archival services. "Zimmerman Library at the University of New Mexico, August 9, 2011" by Steven R. Harris is licensed under CC BY-SA. N.d. University Libraries: History at a Glance. http://library.unm.edu/about/docs/brief-history.pdf, accessed April 20, 2015.